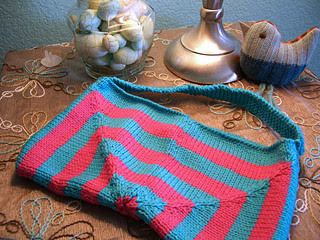 Both are knitted with cotton and also inspired by the Katja baby halter top on Knitty. I just wanted to play with the pattern. 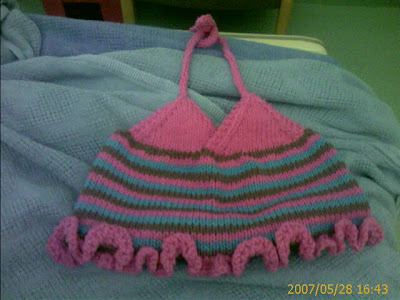 The top halter is sized for an 18 month old. The bottom is for a 3 month old and I wrote out the pattern for it. If there is interest, I could write out the pattern for the top one, too. Blanket, Book, Bag, and Breasts! 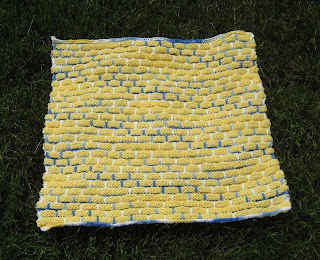 I'm using Knit Picks Swish Superwash and recommend it! Finally, if you'd like to donate to my fundraising efforts, please see my personal donation page. I walk to honor those with breast cancer, and also to honor those people who have any type of cancer. I'm not a doctor so I can't provide a cure, but I can walk 60 miles and raise money for research and education. Somehow this blanket is taking less time than my last log cabin blanket, but it's larger. I would like to think that I'm even more motivated to get it done so that I can start on the Flying Geese blanket and to finish it before the horrible heat of June arrives. I've modified this blanket to work with the yarn that I'm using and to make it a bit different than the pattern calls for. I just felt like it needed another band at the bottom than the two large blocks, so I added the lighter purple block before doing the two large blocks. Finished my Scribble scarf and absolutely love it! Been having people stop me to ask about the scarf and several are amazed when I tell them I knitted it. If you are thinking about doing one, go for it and you will be glad you did! More info on GottaKnit! 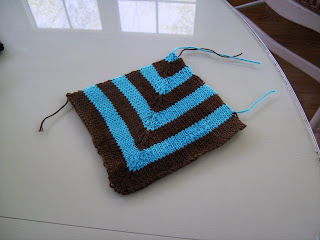 I love knitting dishcloths and do so all year long but there is something about this time of year that gets me in the mood to knit household items.. Last week I knit 4 dishcloths and started the chevron handtowel. 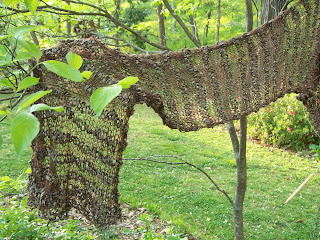 I have wanted to knit one for a long time. I bartered with someone for some bamboo yarn- a linen like sheen and soooo soft. Argggg!!!!! @$?$%blogger!!!! My sister Joy, who is also a member of this KAL, is having trouble posting now that they have made us changeover. 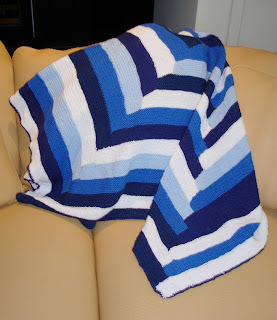 "just finished my third log-cabin blankie! whew! i love them, but three is enough. the first one was for me, and the other two were for my daughters. " I was at Michaels yesterday and they had super-huge skeins of worsted weight Sugar 'n Cream in lots of good colors. I'm glad because when I want to buy large quantities, I'm limited to the cones, and the stores around here carry 2 colors in the cones, maybe 3. Dishcoths were a big hit with the teachers this year for Christmas so I've decided to give them Dishwashing Diva's this year. 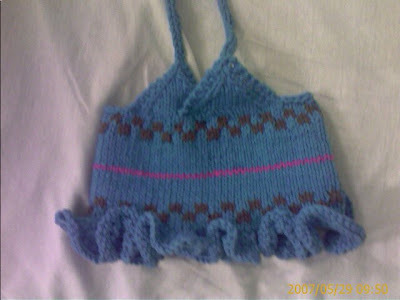 It's a modified Heartbreakingly Cute Baby Kimono, based on the changes described here. 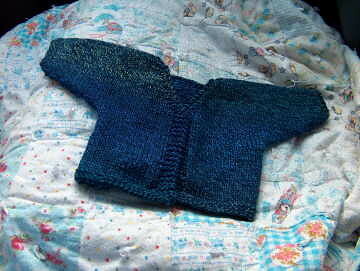 I added a little bit of garter stitch at the cuffs because I didn't like the way the ones on my first kimono came out. It took an evening and a half to knit and when I bound off there was just enough yarn left in the skein to sew up the seams. I still can't believe I didn't run out. May strong spunky women continue to knit for many years to come. 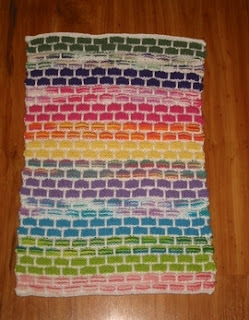 Here is a dish towel based on the ever popular Ball Band dishcloth. I had all these small left overs of cotton yarn that would not make a whole dishcloth so I thought I would de-stash the the odd bits with a towel. The de-stashing worked a bit- but then I had to buy more colors to fill out some of my color scheme. This caught Ann's eye while I was working on it when she and Kay visited Abundant Yarn and Dye Works in Portland, Oregon. Ann said "I've never seen one in so many colors." Is that good or bad? Anyway it's very cheerful and I like it well enough that I actually hesitate to use it. Last summer, I was inspired to make a mitered-square tote bag - a panel of 4 squares on each side. And I wanted it to be in those crazy colors that I remember from those 90s windbreaker suits. I started running out of yarn, so it became a clutch. Basically I seamed together 4 mitered squares, then mattress-stitched them up the sides. I picked up 6 stitches along one edge, knit a garter stitch strap, bound off the strap and then stitched it to the other side. I'm toying with the idea of felting it. Anyone have an opinion on that? I enjoyed doing the miters but I don't know if I have the stamina for a full-blown blanket. So much work and time, and my perfectionist-nature won't let me fudge on the seaming - I know I'd agonize over making those stripes line up! I really respect those of you who have taken on the blanket. Couldn't resist posting a photo of MY FIRST MITER!!!!! Whoooohoooo one down...a billion katrillion to go.